Cricklewood station is on the list. 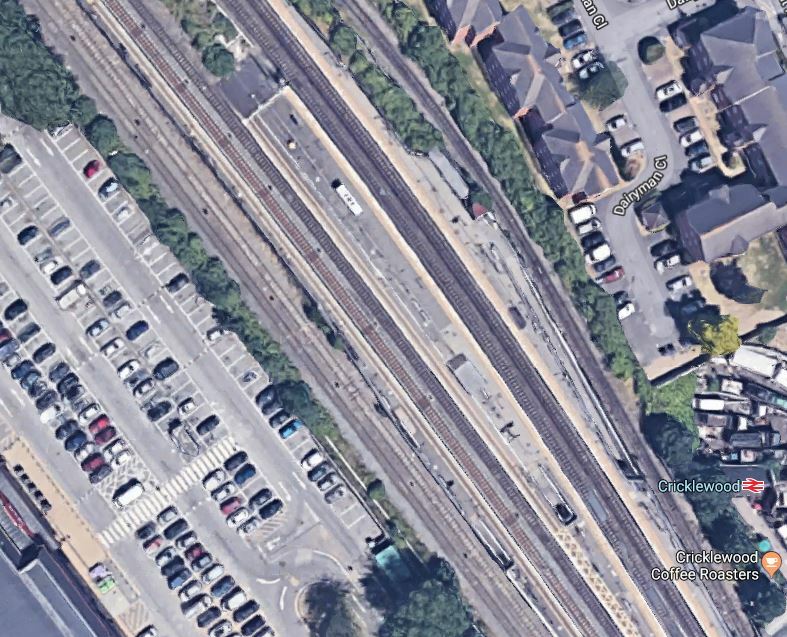 This Google Map shows the platforms at Cricklewood station. There are three island platforms with two faces. Not all are used. Each island platform has a set of stairs to a subway. Two pairs of lines pass between the platforms. The fast lines are are the Western pair and the slow lines are the Eastern ones. Platforms are numbeeds from right to left. To the West of the Western platform, there are two freight lines, which might also be used for the West London Orbital Railway. This map from carto.metro.free.fr shows the lines in detail. 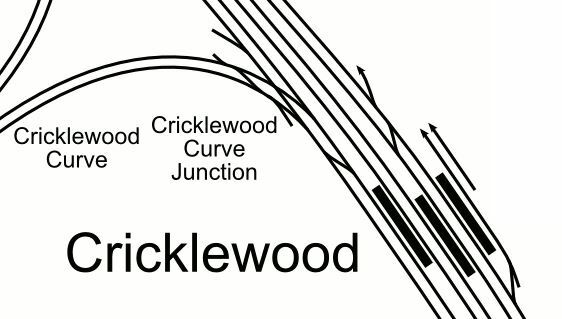 Note how the freight lines are directly connected to the Dudding Hill Line, that goes off to the West, via the Cricklewood Curve. These are a few pictures of the station. Note that the subway and the station entrance appear to be iin good condition. This type of station with a subway under a series of platforms isn’t as common in the UK, as it is on the Continent. But there are several examples in the UK, where this type of station has had Subway-to-Platform lifts installed. Examples can be seen at Finsbury Park and Stratford stations. The West London Orbital Railway may be built in the next few years. One route could connect West Hampstead Thameslink and Hounslow stations and could have a stop at Cricklewood station. This might mean that up to two extra platform faces would be needed at Cricklewood station, in which case provision must be made to extend the subway and add lifts to any new platforms. An alternative could be to use bi-directional working between Cricklewood and West Hampstead stations. Only four trains per hour (tp[h) are planned to use the route. The distance between the two stations is only around a mile. Spare faces of existing platforms could be used at both stations. four tph can easily be handled in a terminal platform. No extra tracks would need to be laid. It would certainly reduce the cost. This is a relatively easy station to make step-free and it could also be made ready for the West London Orbital at the same time. Wouldn’t it be wonderful if to build, the West London Orbital, just needed the following. Finish step-free access at Cricklewood and Isleworth stations. Refurbish and update the track, signalling and points and crossings. Build a platform at West Hampstead Thameslink station. Build a platform at Houslow station. Open an initial service using battery-electric trains between West Hampstead Thameslink and Hounslow stations calling at Cricklewood, Acton Central, South Acton, Brentford, Syon Lane and Isleworth. Build the new intermediate stations. Too often Network Rail’s project management is strung out over a long period, because they play far too safe and attempt not to spend any money! Here boldness is possible, as there are no large sub-projects, except building the new stations, so they can be done afterwards by developers, who would like to build large numbers of flats with a station in the basement. I believe that as the railway is there and working, once it has been refurbished and three important platforms have been added, battery-electric trains could start a service. What better advertisement for your development, than to see the trains to the important hubs at Old Oak Common and West Hampstead, already running through the building site! London needs more new rail services, more new and refurbished fully-accessible stations and a lot more housing! So why not do them all as a partnership?